Dare to dream. Believe in yourself. This holiday season, the Canadian Paralympic Committee and Pfizer Canada are paying tribute to Canada's Paralympic athletes by offering a free, inspirational gift to the nation. 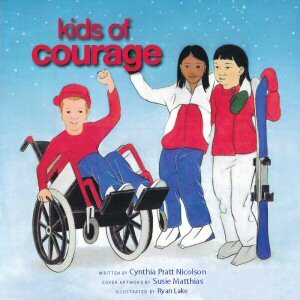 Starting on December 3, 2009 - International Day of Persons with Disabilities - through to March 2010, parents, teachers and families can download Kids of Courage, a free online book dedicated to Canada's Paralympic team. Audio formats of the book, introduced by members of Canada's Paralympic team and e-book versions are now available online. Download them at morethanmedication.ca and through a link at paralympic.ca. Created by Vancouver-based, award-winning author and former school teacher, Cynthia Pratt Nicolson, the stories honour Canada's most inspiring athletes by showing how their unwavering belief in themselves can encourage us all to reach for our dreams. Cover artwork was created by well-known Canadian mouth-painter Susie Matthias. "This e-book shows that when you dream big and believe in yourself you can achieve amazing things," says Henry Storgaard, CEO, Canadian Paralympic Committee, adding that Canadians will get to see the determination and skill of Paralympians in action during the lead-up to March 2010. In addition to making free downloads of the e-book and audio book available to Canadian parents, teachers and families, the CPC and Pfizer Canada are donating 40,000 books throughout January to libraries across the nation. Special Braille editions of the book are also available for educators. "It's energizing to feel the outpouring of support from our friends at Pfizer and from sports fans across Canada," says Canadian sledge hockey player Benoit St-Amand. "We hope these stories will encourage Canadians to learn more about Paralympic sport and watch us in action this March. Most of all, we hope these stories will encourage Canadians to reach for their own dreams and do everything they can to live a healthy, inspired life no matter what." The e-book, audio book and Paralympic partnership are all part of Pfizer Canada's More Than Medication(TM) wellness initiative. More Than Medication is devoted to helping Canadians live healthier lives by providing comprehensive, non-medicinal health and wellness information. More Than Medication initiatives never mention products or medications. In addition to its inspirational tribute to Canada's Paralympians, visitors to the More Than Medication website can also access a variety of wellness tools, across six health areas that include: Eat Better, Manage Stress, Strengthen your Mind and Body, Relate Better, Be in Charge of your Own Health Care and Be Brave. A steadfast supporter of the Canadian Paralympic Team for more than a decade, Pfizer Canada Inc. is the Canadian operation of Pfizer Inc, the world's leading biopharmaceutical company. The company is one of the largest contributors to health research in Canada. Our diversified health care portfolio includes human and animal biologic and small molecule medicines and vaccines, as well as nutritional products and many of the world's best-known consumer products. Every day, Pfizer Canada employees work to advance wellness, prevention, treatments and cures that challenge the most feared diseases of our time. We apply science and our global resources to improve the health and well-being of Canadians at every stage of life. Our commitment is reflected in everything we do, from our disease awareness initiatives to our community partnerships, to our belief that it takes more than medication to be truly healthy. To learn more about Pfizer's More Than Medication philosophy and programs, visit morethanmedication.ca. To learn more about Pfizer Canada, visit pfizer.ca. More Than Medication(TM) is a trademark of Pfizer Canada Inc. The Canadian Paralympic Committee ("the CPC") is a non-profit, private organisation with 43 member sports organisations dedicated to strengthening the Paralympic Movement. The CPC is responsible for creating an optimal high-performance environment for Canadian Paralympic athletes to win at Paralympic and ParaPanAmerican Games. By supporting Canadian Paralympic athletes and promoting their success, the CPC inspires all Canadians with a physical disability to get involved in sport through programs delivered by its member organisations. The Canadian Paralympic Committee is currently preparing for the Vancouver 2010 Paralympic Winter Games, taking place from March 12 - 21, 2010 and where 55 Canadian Paralympic athletes will compete in Para-Alpine skiing, Para-Nordic skiing (cross-country skiing and biathlon), sledge hockey and wheelchair curling. For more information, visit www.paralympic.ca. About this company Pfizer Canada Inc.
Get Inspired. Read Kids of Courage a free online book dedicated to Canada's Paralympic team at morethanmedication.ca/Paralympic.